Soloist/Music Producer and now Author of Proverbs 31: The Virtuous Black Woman, addresses the value of Black Women in poetic pros, expressing the respect and dignity that men should have for Black Women and all women. Russel is also a highly accomplished jazz soloist, having performed with Masakela, Cybil Shepherd, Chaka Khan, Harry Belafonte, El Gran Combo, Wynton Marsalis, Dee Dee, and many more. His latest musical work and CD is Fierce Solitude. 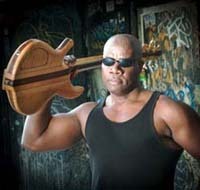 “Among his highest achievements was his appointment by the U.S. State Department to perform as an Ambassador of Goodwill to Eight West African Nation’s, and was also contracted by the U.S. Department of Defense to lecture on the symbiotic nature of Science and Music for DARPA’s (Defense Advanced Research Agency) Conference.” Additionally, Russel is a speaker of the reknown Smiley Group, Inc.
For more information about Russel, visit www.russelblake.net. Tune in Tuesday, June 28th at 9 PM Eastern, 6pm Pacific to www.party934.com, 94.9 FM Hudson Valley, NY to hear this amazing pro-woman, spiritual author, educator, and jazz bassist Russel Blake. 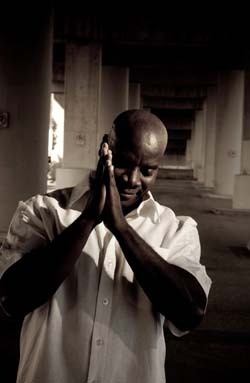 We will be featuring the music of Russel Blake during the hour broadcast!